This live show features all of your favorite hits from the Eagles, performed by some of the top musicians and singers in the industry. The show plays at the Tribute Theater, one of the most renowned in a city filled with entertainment venues. The tribute band honoring the Eagles is made up of incredible performers, the vocalists include Brennan Crim, Robbie Danna, Larry Holiday, Eric Rankin and Greg Morton performing onstage. Each performer brings something different, enabling you to go back in time to the first time you heard a song from this all-American band. Songs featured during the show include incredible hits, such as 'Desperado,' 'Witchy Woman,' 'Seven Bridges Road,' 'Take It Easy' and even 'Hole in the World,' off of the newest Eagles album. Take It to the Limit: A Tribute to the Eagles has played around the US for several years, and has featured innumerable performances of this Hall of Fame band's music. 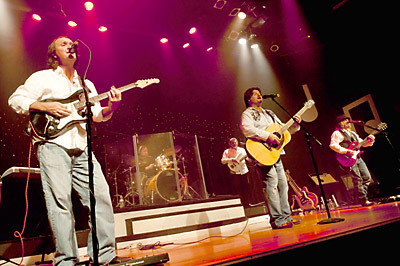 There is no better way to spend time in the city of Branson than with the timeless hits of the Eagles! Ready to buy? Click Here to reserve your tickets!